Great news! The online International Gallery of Electro-Aware Artists is now live on my Refugium website. 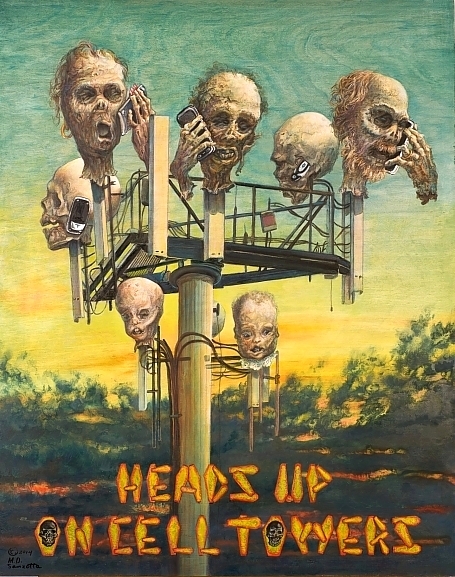 Please visit the gallery here: https://electroplague.com/electro-aware-artists/ . My thanks to each of them for contributing work to this project that seeks to make the invisible world of frequencies and electropollution visible through art. I am looking for more Electro-Aware Artists to add to this gallery. If you have visual art that addresses the theme of electro-pollution, please send a hi-res jpeg plus a brief Artist Statement about your thoughts and experiences with electro-pollution and Electromagnetic Hypersensitivity to goldberg@ncf.ca . All styles of visual art welcome—paintings, drawings, photography, graffiti, collage, mixed media, computer-generated, comic strips, fabric/fibre art, or 3D art that you can photograph such as sculpture or installation art. This entry was posted in Art and tagged artists, Australia, Cat Leonard, Mardel Sanzotta, Netherlands, Tom van Campenhout, Trish Garcia, USA on May 31, 2014 by Kim Goldberg. Reblogged this on Pig Squash Press.